Byron Bay Holiday Accommodation Perfect For Family Fun! You are here:Home » Blog » Byron Bay Holiday Guide » Byron Bay Holiday Accommodation Perfect For Family Fun! Time to pack away the school books, bring out the camping gear and take the family on a well deserved holiday. As every parent knows, just taking your kids away for a holiday is not enough. You need to ensure that there is enough to keep them busy when planning your holiday. This year why not visit Broken Head Holiday Park, affordable Byron Bay holiday accommodation that has a range of activities designed to keep kids of all ages entertained. Byron Bay holiday accommodation provides the perfect location to get some family surfing lessons under the belt. You’re never too young (or too old) to learn to catch a wave and ride it all the way to the beach, making this a fun activity that the whole family can participate in. The wide variety of surf schools in the area offer different lessons for kids as well as adults. If you already know how to make the best of the surf, why not find a surf school that can teach you a few new tricks. Qualified kayaking guides will be happy to take show your family how to paddle the ocean and get closer to the variety of sea creatures in the area. Paddle boarding is all the rage at the moment and you can learn the basics in a quiet river environment before taking on the ebb and flow of the tidal waves in the sea. The Suffolk Park Skate Park is a great way for your older kids to have some fun while parents can take a bit of a break. If your kids aren’t into skating, the basketball court, cricket nets, tennis courts and children’s playground are sure to keep them busy. Remember to pack the skate and sports gear to take along to your Byron Bay holiday accommodation and make the most of the park. Byron Bay holiday accommodation is in great demand at this time of year but if you book now, you may still be able to take advantage of all that Byron Bay has to offer. 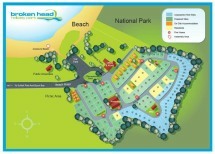 Broken Head Holiday Park has decreased their minimum night stay from a 7 night minimum stay to just 3 nights! This is the ideal chance to book a short family getaway over school holidays between December and January. There are still beach cabins and powered camping sites available for reservation right up until Boxing Day and you can still reserve 3 nights stays from the 17th of January. The smaller 2-3 man tent sites are available for booking even earlier in the year from the 2nd of January. Simply contact us today and we will book your short getaway or extended school holiday and take care of all your Byron Bay holiday accommodation requirements.